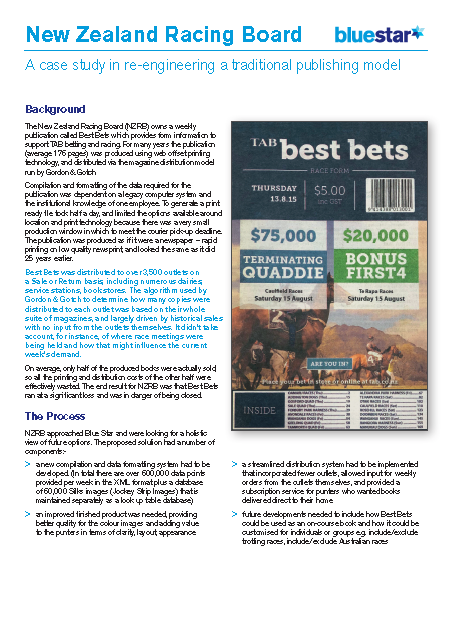 The New Zealand Racing Board (NZRB) owns a weekly publication called Best Bets which provides form information to support TAB betting and racing. For many years the publication (average 176 pages) was produced using web offset printing technology, and distributed via the magazine distribution model run by Gordon & Gotch. Compilation and formatting of the data required for the publication was dependent on a legacy computer system and the institutional knowledge of one employee. To generate a print ready file took half a day, and limited the options available around location and print technology because there was a very small production window in which to meet the courier pick-up deadline. The publication was produced as if it were a newspaper – rapid printing on low quality newsprint, and looked the same as it did 25 years earlier. Best Bets was distributed to over 3,500 outlets on a Sale or Return basis, including numerous dairies, service stations, book stores. The algorithm used by Gordon & Gotch to determine how many copies were distributed to each outlet was based on their whole suite of magazines, and largely driven by historical sales with no input from the outlets themselves. It didn’t take account, for instance, of where race meetings were being held and how that might influence the current week’s demand. On average, only half of the produced books were actually sold, so all the printing and distribution costs of the other half were effectively wasted. The end result for NZRB was that Best Bets ran at a significant loss and was in danger of being closed.